Manchester Show 2011: Optoma brings down the cost of 3D projection | What Hi-Fi? Optoma says its bringing down the cost of Full HD 3D projection with its stylish new HD33 DLP projector. Retailing at £1350, the HD33 comes with one pair of rechargeable 3D glasses which use wireless RF transmission, rather than the more usual IR (infra-red) system, for more stable syncing. Additional pairs of glasses are £80 each. 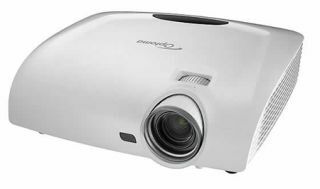 The projector is powered by Optoma's PureEngine technology, including PureMotion4 and PureD, designed to create clearer, sharper pictures. Claimed contrast ratio is 10,000:1 and brightness is 1800 ANSI Lumens. There's a full range of digital and analogue inputs, including two HDMI inputs with 1.4a 3D support.